The NHS produces around 22.8 million tonnes of carbon emissions each year, which accounts for approximately 25 per cent of emissions made in the public sector. The amount is about the same as every aircraft at Heathrow airport over the same period, and there’s increasing pressure to adopt initiatives to lessen the health service impact – both on the environment, and on the public purse. After nearly 30 years working with and for the ambulance service, a branch of the NHS, I decided to research into sustainability initiatives and what we could do to help. And I am one of the first paramedic researchers in the UK to explore and scope this topic, through conducting primary research phases within a PhD pathway. Having looked at evidence from all over the world, I’ve observed many studies that suggest that climate change is causing a rise in global temperatures, leading to a negative effect on health, through a range of direct and indirect exposures. This, in turn, is causing more ambulance call outs, which affects the ability to maintain response time targets and increases admissions to emergency departments. In effect, the research evidence suggests that global warming is making us all work harder. But little has yet been done on how the ambulance service contributes to climate change. By doing our bit to combat it, we can help us all. Undoubtedly, there are three main areas where paramedic practice is contributing towards carbon emissions: fuel consumption, energy or utility use, and waste management. Some studies have attempted to quantify the carbon footprint of ambulance operations. In the UK, the total annual figure for ambulance services has been estimated as 214,972 tonnes of CO2 equivalent – and this is a conservative estimate. Nobody would argue that ambulances need to drive quickly in an emergency, but, as fossil fuel prices rise, the logical step is to reduce the consumption, adapt to alternative fuel sources for vehicles, or supplement fuel use with recycled energy. Hence there are projects for reducing fuel consumption that include electronic or hybrid vehicle technology, alternative fuel sources (such as hydrogen cells, along with methanol cells and solar panels to keep the batteries for ancillary equipment charging), aerodynamic advances in vehicle design, weights and efficiencies of vehicles (especially around chassis weight) and development of eco-driving skills. However, these low carbon options must become a feasible and attractive option to implement across the UK fleet. When it comes to equipment use and waste management, there is an urgent need to reduce the amount of waste generated by healthcare activities, as this contributes significantly to the carbon footprints of healthcare organisations. Contemporary publications on the effective management of waste within the NHS have highlighted a need for change in behavioural practice with disposal and recycling. There has been significant improvement in the procurement of resources, which includes packaging reduction to reducing waste generation and the purchasing of equipment that has a greater propensity for reuse and recycling. However, one of the bigger areas to target is the appropriate segregation of waste at the point of use. The ambulance service has set up a Green Environment Ambulance Network (GrEAN) – a collective of sustainability managers committed to reducing carbon emissions for ambulance service trusts in the UK. Over the last few years, they have been investigating and implementing strategies that help to mitigate unnecessary energy consumption, or streamlining processes and systems to make our use of resources more cost effective. But how effective have they been? I interviewed sustainability managers to have a look at the initiatives they were developing and the good work they were doing. There’s no doubt that their work is a step in the right direction and deserves to be internationally disseminated. The next step was to see if and how these initiatives were being translated by the workforce as a whole. From my ethnographical data and time spent in conversation with operational ambulance staff, it is always surprising to learn how many are keen to be ‘green’ at home and have strong values when it comes to recycling and energy efficiency savings, but when they are in the working environment, those same principles can be largely overlooked or forgotten. It really is a matter of good housekeeping principles. I think it’s important to embed sustainability into a person’s thinking right from the start and so, as an output of my research, I am developing a resource to embed sustainable thinking into the student paramedic curriculum. 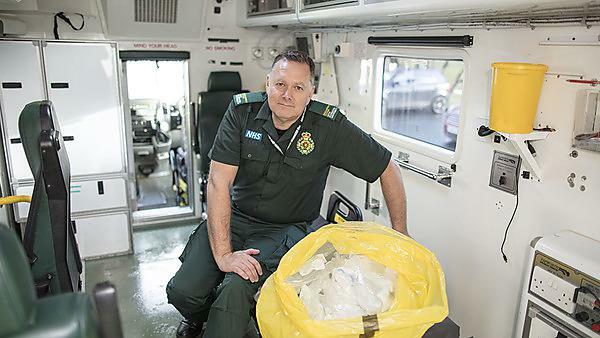 Student paramedics have nothing formal in their current training to help them think about sustainability behaviours, so the package can be incorporated into lectures across higher education institutions in the UK. As paramedics, paramedic students and operational ambulance staff, we can be the vanguard for influencing best practice in the NHS. What you do can make a real difference, by making simple cultural changes and adopting the right practices. Reducing carbon emissions and sustainable development within organisations are indisputably corporate responsibilities. However, ethically, they are also all of our responsibilities. Following a curriculum that is informed by service users and carers, and focuses on quality patient management, you'll work in the unpredictable environment of pre-hospital healthcare and, as such, you will learn how to be dynamic with your decision-making, aptitude and application of skills.